Been diving in Tatawa Besar? Please Vote! 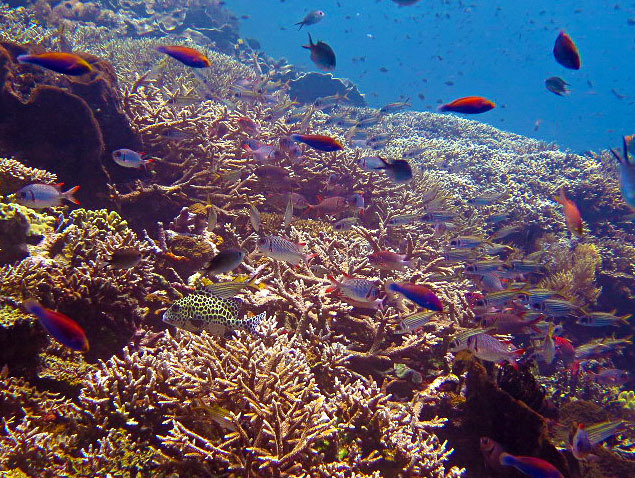 Tatawa Besar is famous for having some of the most astonishing coral gardens in the Komodo National Park. 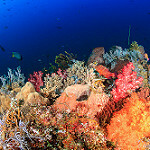 Given the diversity of coral in the national park, this makes the site one of the best coral gardens in the world. In fact, there is so much coral to be seen, it is worth doing this dive more than once, and it definitely will be entertaining every time you dive it. To start the dive, you enter from in front of a small beach with the dive site at 6 meters depth. 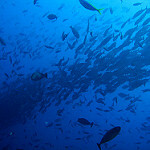 You then allow the current to take you on a drift dive above the reef at a depth of about 25 meters. If the current is not too strong, you can make your way back to the start or wait for a dive boat to come and pick you up. The size of the garden means that you can drift along for hundreds of meters with the vast corals underneath you as you dive. You will be accompanied by cuttlefish, turtles, lionfish, triggerfish, batfish and it is easy to spot sharks swimming amongst the gardens. Small invertebrates are also very common, making this spot ideal for macro divers and especially for macro photographers. “Tatawa Besar.” Meaning “big smile” in Indonesian, this is a site that certainly lives up to its name, eliciting grins from even the most salty, “seen it all” divers. Good in most conditions, my favorite dives on Tatawa were in a mild to medium current; just enough to attract schooling fish and curious black-tip reef sharks, while still allowing you to search for macro life in the gentle sloping reef. Turtles were frequent visitors, with either heads stuck comically in the reef, or gently cruising alongside. The variety and density of coral cover makes excellent coverage for nudibranchs, eels, and a variety of fish, even the elusive frogfish. On a particularly special dive, a dolphin and her calf bobbed and weaved around us, likely wondering what all our frantic, excited waving was about. Tatawa Besar, however, saves its best for last, when the shallows transform into a pristine staghorn coral garden. Like a vast, underwater forest of leafless trees, the coral is accented by thousands of impossibly bright fish, darting in and out of the branches’ protection. It was this part that leaves divers feeling like they had swam straight into a postcard from the Coral Triangle. Map of Komodo, Tatawa Besar dive site.